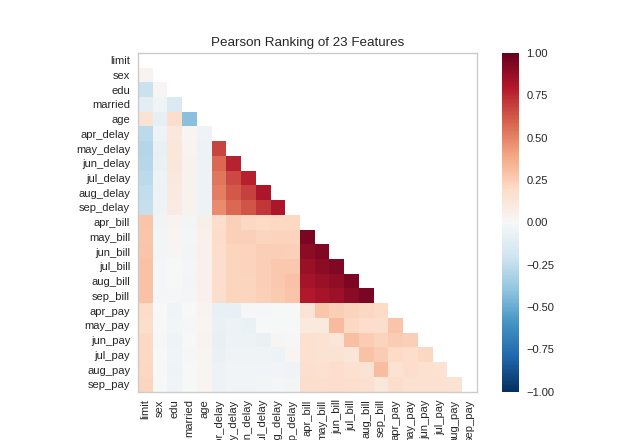 Rank1D and Rank2D evaluate single features or pairs of features using a variety of metrics that score the features on the scale [-1, 1] or [0, 1] allowing them to be ranked. A similar concept to SPLOMs, the scores are visualized on a lower-left triangle heatmap so that patterns between pairs of features can be easily discerned for downstream analysis. In this example, we’ll use the credit default data set from the UCI Machine Learning repository to rank features. The code below creates our instance matrix and target vector. A one-dimensional ranking of features utilizes a ranking algorithm that takes into account only a single feature at a time (e.g. histogram analysis). By default we utilize the Shapiro-Wilk algorithm to assess the normality of the distribution of instances with respect to the feature. A barplot is then drawn showing the relative ranks of each feature. A two-dimensional ranking of features utilizes a ranking algorithm that takes into account pairs of features at a time (e.g. joint plot analysis). The pairs of features are then ranked by score and visualized using the lower left triangle of a feature co-occurence matrix. By default, the Rank2D visualizer utilizes the Pearson correlation score to detect colinear relationships. 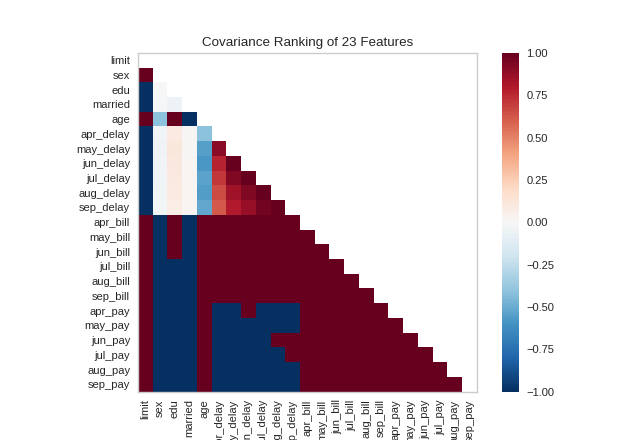 Alternatively, we can utilize the covariance ranking algorithm, which attempts to compute the mean value of the product of deviations of variates from their respective means. Covariance loosely attempts to detect a colinear relationship between features. Compare the output from Pearson above to the covariance ranking below. Implements 1D (histograms) and 2D (joint plot) feature rankings. Rank1D computes a score for each feature in the data set with a specific metric or algorithm (e.g. Shapiro-Wilk) then returns the features ranked as a bar plot. 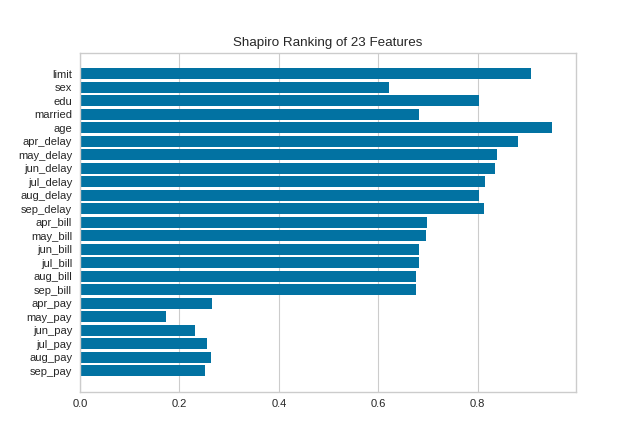 The ranking algorithm to use, default is ‘Shapiro-Wilk. A list of feature names to use. If a DataFrame is passed to fit and features is None, feature names are selected as the columns of the DataFrame. Specifies a horizontal or vertical bar chart. If True, the feature names are used to label the x and y ticks in the plot. An array of rank scores with shape (n,), where n is the number of features. It is computed during fit . Draws the bar plot of the ranking array of features. Rank2D performs pairwise comparisons of each feature in the data set with a specific metric or algorithm (e.g. Pearson correlation) then returns them ranked as a lower left triangle diagram. The ranking algorithm to use, one of: ‘pearson’, ‘covariance’, ‘spearman’, ‘kendalltau’. If True, the feature names are used to label the axis ticks in the plot. An array of rank scores with shape (n,n), where n is the number of features. It is computed during fit . Draws the heatmap of the ranking matrix of variables. © Copyright 2016-2019, The scikit-yb developers. Revision 26380a2b.